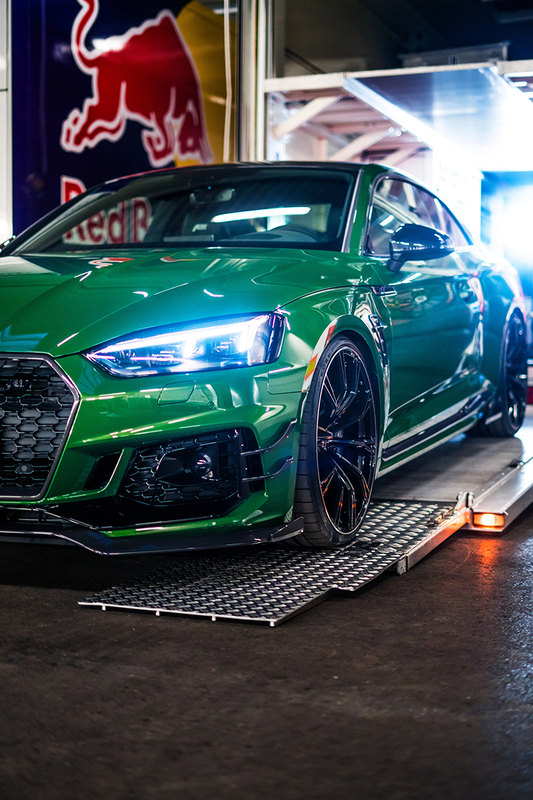 ABT Sportsline has hidden an entire subcompact car in the power boost for the current Audi RS5-R. “On the ABT RS5-R, we get an additional 80 HP and 90 Nm from the 2.9 liter biturbo V6, which has a very similar design to the engine in the first Audi RS4,” CEO Hans-Jürgen Abt proudly explains. The vehicle, which is limited to 50 units, will be presented live for the first time at the Geneva International Motor Show (March 8 to 18, 2018). ABT muffler system which is part of the performance concept and offers the snarling, charismatic V6 sound that is loved by car enthusiasts all over the world. With its four carbon tailpipes with a diameter of 102 mm, it is a feast for the eyes and ears. ABT SPORT GR 21 inch rims. The athletically styled wheels have not an ounce of unnecessary weight and feature a strongly concave rim base. The tire format is 275/25 ZR21. A look at the aerodynamic features in the rear view mirror reveals to other drivers just who is behind them. The new ABT front lip, the ABT front flics and the ABT front grille frame with RS5-R logo will catch anyone’s eye. Overtaking then reveals the aggressive flanks with the optional ABT wheel arch vents, which feature carbon fins. The new add-on parts at the rear are also made from glossy visual carbon – the rear skirt add-on as well as the spoiler. But this is not a view to be enjoyed for long, because the ABT RS5-R will usually disappear again in a fraction of a second. What bystanders will not get to see: The individual interior design, including partial leather seats with RS5-R logo, ABT gear shift cover (carbon), ABT RS5-R “1 of 50” badge and many other extras. This turns the ABT RS5-R into a truly fascinating overall package.